Okinawa’s corporate leaders are enamored by golf, making it the island’s number one hobby in a new survey. The poll by Tokyo Shokou Research Okinawa was directed to more than 10,000 business presidents and chief executive officers. 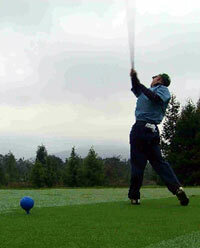 The compilation showed 39.6% of the respondents favored golf for relaxation and companionship, but also for business. Fishing ranked second in the survey, with 10.7% of company presidents explaining how they like taking to the water. Reading books was third with 5.8% of those answering, other sports was fourth at 4.8% and listing to music was fifth, a favorite with 2.1% of the business leaders. Fishing, sports and gardeners were most popular with construction company presidents, while music lovers were mostly retailers and business distributors. Finance and service business professionals favored reading books. Golf ranked number one with business leaders over 60, as well as with those 40~59. The older presidents like playing Igo games, too, while the younger executives talked of their passion for gardening. Other hobbies registered in the survey were making bonsai, jogging, painting, karaoke, tennis, swimming, photography, sightseeing and going to movies.